Break through the toughest and most violent defenders in the world and get to the goal! 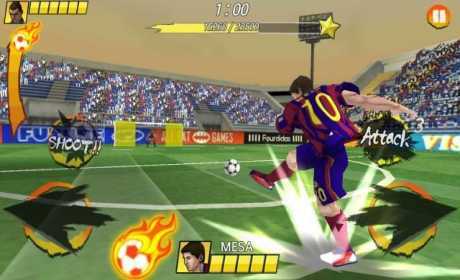 # Play the mind-blowing football game! Rush and Dodge through dozens of defenders rushing towards you and score goals to win the match. Use your sense of rhythm, speed, and concentration to break through the impregnable defense. Conquer the 5 soccer leagues and become the number one team in the world. This is fantastic soccer game. # Use your playerâ€™s abilities to the max to win matches! Eleven international star players aiming to become the best in the world are waiting for you. Players have skills like Tussle to knock down defenders at a critical moment and Deadly Shot that can decide the outcome of the match. You can have 1 additional player and use Pass to change the player. # Get help from various items and the Team Doctor! Various items are provided to strengthen your players and turn the match to your advantage. Try to use them in a difficult match. Also, beautiful Team Doctors are on standby to support you. Use a Team Doctor to recover your playerâ€™s HP. # Complete the missions to achieve higher goals! 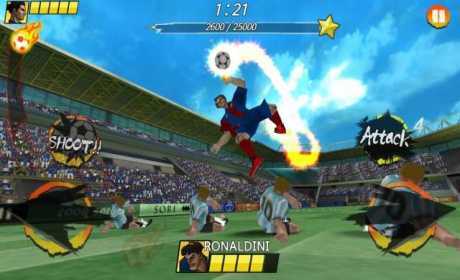 There are special missions for those who have mastered soccer league games. Overcome various harsh conditions to complete missions. Get honor points from missions and compete with your friends through the Leaderboard. You are footballking!, You are soccerking!